Chennais Regional Meteorological Centre has mentioned that there will be heavy rains in delta districts in Tamil Nadu. As expected no 100 mm (10 cm) rainfall fell in Chennai. No flooding rains happened. No thunderstoms happened. The twitter post of BBC showing heavy rains for Chennai on Wednesday went viral in all social media. Heavy rains expected in coastal & delta districts! The low depression zone formed over the Southwest Bay of Bengal has stabilised. As it has remained static without any movement, the meteorological centre has announced that there will be very heavy rains in all coastal and delta districts. 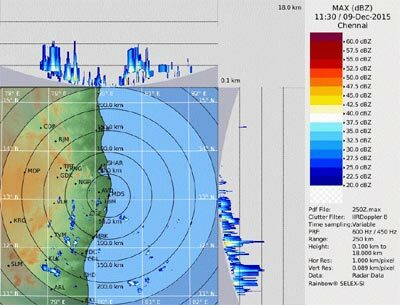 Chennai Meteorological department has announced that Tamil Nadu and Pondicherry will receive heavy showers in the next 24 hours. I am getting lot of messages about BBC forecast. What is BBC forecast. They follow UKMET numercial weather model. After GFS and ECMWF this is the 3rd ranked model in world. India Met Department outlook has maintained a heavy to very heavy rainfall alert for North-Coastal Tamil Nadu (including Chennai and neighborhood) for today also. In Chennai sky condition would be generally cloudy. Few spells of rain or thundershowers would occur in some areas , heavy at times. Sporadic rains continued to lash the city and suburbs today which were limping back to normalcy, aided by improved bus, train and communication services. Mornings low pressure area over Sri Lanka and adjoining Comorin area off South Tamil Nadu Coast persists.